A University of Phoenix banner was on display at the for-profit college’s recruitment event at Fort Campbell last year that featured country rapper Big Smo. “Getting out living every day of my life,” the rotund country rapper bellows as he bounds around the stage, wearing a necklace made of beer can tabs. “Southern swag in my blood, so to hell with a wife.” The soldiers from the 101st Airborne Division rise to their feet and cheer. This is not just any concert. It’s a recruitment event for the University of Phoenix, the proprietary college that is far and away the largest recipient of taxpayer money under the post-9/11 GI Bill. That iconic program launched during World War II now pays college tuition for Iraq and Afghanistan veterans. A representative of the Army’s Family and Morale, Welfare and Recreation Programs introduces the University of Phoenix’s military liaison, Craig Morton, as a friend of the armed forces. Morton, the representative says, gave away five Galaxy computer tablets to soldiers before the concert. 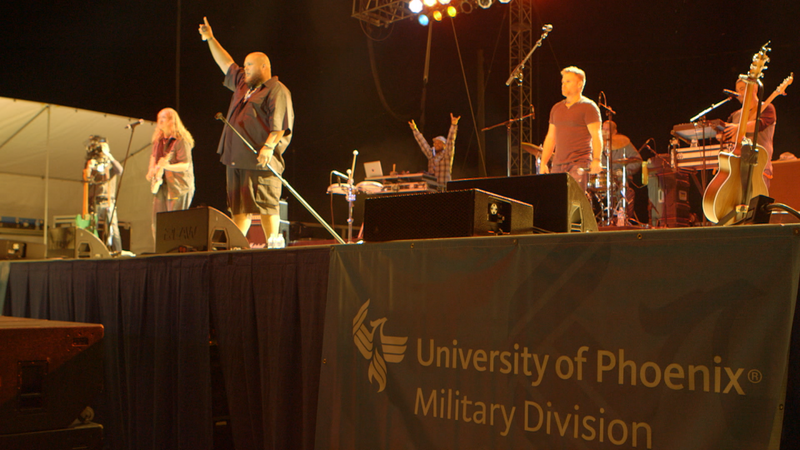 The University of Phoenix paid the military $25,000 to sponsor last October’s concert, according to records obtained through the Freedom of Information Act. That sponsorship allowed the institution to sidestep an executive order by President Barack Obama intended to prevent for-profit colleges from gaining preferential access to the military, including freely dispatching recruiters to bases. In signing the order at Fort Stewart in Georgia, Obama warned soldiers in April 2012 that such institutions are “trying to swindle and hoodwink you.” His action came after veterans groups wrote to the White House complaining of abusive, deceptive and aggressive recruiting tactics by for-profit colleges, which had been documented in congressional reports and law enforcement investigations. In an extreme example that Obama said “should never happen in America,” recruiters from one college were caught enrolling Marines from a medical unit at Camp Lejeune in North Carolina with head injuries so severe that they did not know what courses they were taking. Military regulations adopted as a result of Obama’s order “ban inducements, including any gratuity, favor, discount, (or) entertainment” for the “purpose of securing enrollments of Service members.” Recruiting activities are supposed to be limited to education fairs and other narrowly approved activities where every school would have equal access. But the regulations say nothing about sponsoring events. Internal University of Phoenix company documents obtained by Reveal show that the Big Smo concert is part of a sophisticated recruitment strategy. At its heart is a deliberate effort to create the impression that the college is sanctioned and even recommended by the armed forces. The strategy has included engaging in recruitment drives disguised as résumé workshops, cultivating veterans’ organizations and utilizing military insignias in school marketing without the required permissions. The strategy also has led the company to pay the military to sponsor hundreds of events on military bases across the country, from rock concerts to Super Bowl parties and father-daughter dances. When a Reveal reporter talked about the sponsorship in a video standup at the Big Smo concert, he was asked to leave. As the reporter and a Reveal videographer were led off base by a sergeant, Holley stood nearby, whispering with the man who had previously been up on the stage, accepting applause: Craig Morton, the University of Phoenix recruiter. Coupled with more traditional television advertising and telephone solicitation, the marketing strategy helped the University of Phoenix capture $345 million in GI Bill funding to educate about 50,000 Iraq and Afghanistan veterans last year and $1.2 billion since 2009, Department of Veterans Affairs records show. Last year, the school also received $20 million from the Pentagon to educate about 10,000 active duty service members. University of Phoenix representatives declined to be interviewed for this story. But when asked to discuss enrollment efforts, Mark Brenner, a senior vice president at the college’s parent company – Apollo Education Group – defended the institution’s record. “The University of Phoenix plays an important role in offering career relevant higher education degree and credential programs to active-duty servicemembers, veterans and military families,” he wrote in an email. But his school’s academic record is checkered, and many Iraq and Afghanistan veterans say they have completed taxpayer-funded educational programs only to discover their degrees are worthless and their job prospects slim. “I’ve seen too many veterans with degrees from the University of Phoenix on their wall and unemployment checks on their bed stand,” said Chris Neiweem, a former Army sergeant who served a tour in Iraq and now works in Washington for the advocacy group Iraq and Afghanistan Veterans of America. In June 2013, the University of Phoenix was placed on notice by its accrediting body, the Higher Learning Commission, for failing to support “student learning and effective teaching.” The commission revisited the issue Thursday, with an announcement expected soon. The University of Phoenix’s online program, by far its largest campus, had 24,000 Iraq and Afghanistan veterans enrolled last year. The graduation rate there was 7.3 percent, according to the Department of Education, and nearly 1 in 5 students default on their loans within three years of leaving school. The rise in veteran enrollments at the University of Phoenix corresponds with an overall plunge in the number of students attending the school and an erosion of profits. Over the past six years, the college has lost half its students, according to company filings with the Securities and Exchange Commission. Profits, which stood at $594 million in 2009, have fallen dramatically. During the same period, the number of Iraq and Afghanistan veterans using their GI Bill there has tripled. 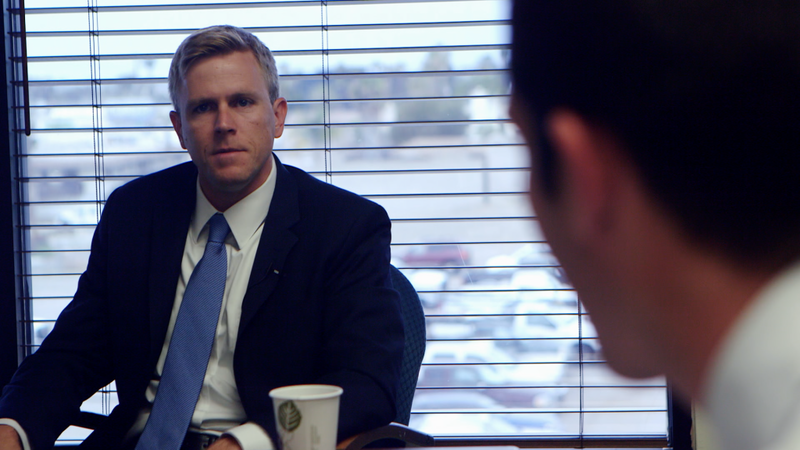 “Civilian students think twice before they attend a for-profit school. They take out a loan. They take a risk,” Neiweem said. Because taxpayers are covering the full cost of tuition for veterans who attend the University of Phoenix, veterans are less likely to pause and think about whether they are getting a good value, he said. “The GI Bill is the blood through the veins of the University of Phoenix. It’s their gravy train,” he said. 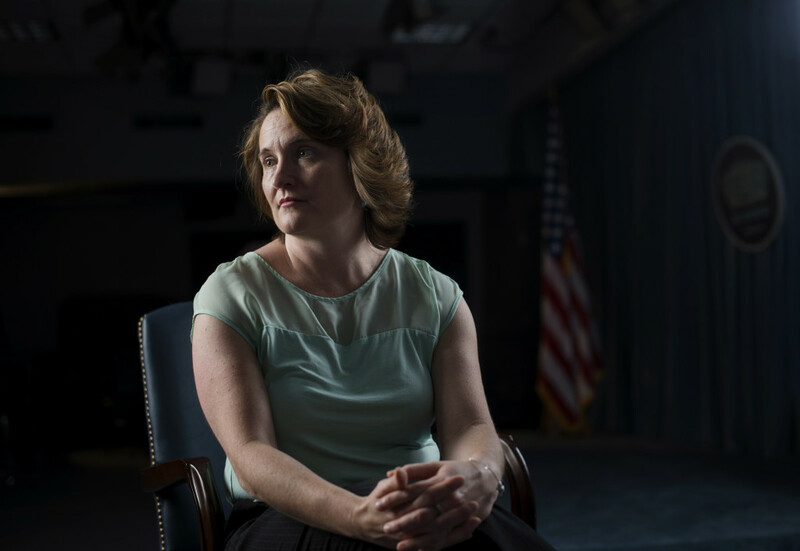 At the Pentagon, Dawn Bilodeau, the military’s chief of voluntary education, has a different perspective. She said the for-profit institution was a top recipient of taxpayer money primarily because of the convenience of its online classes, which allow service members to continue their studies when they are deployed or in a new location. The military, she said, vigorously enforces laws against predatory recruiting. For the past two years, the University of Phoenix has partnered with the U.S. Chamber of Commerce Foundation to hold employment workshops at Hiring Our Heroes job fairs, many of them on military bases. The sessions occur about once a week somewhere in America. Locales on the schedule this summer: an Army reserve center in central Oregon; a National Guard post in Buffalo, New York; and Joint Base McGuire-Dix-Lakehurst – a sprawling Army, Air Force and Navy installation in New Jersey. 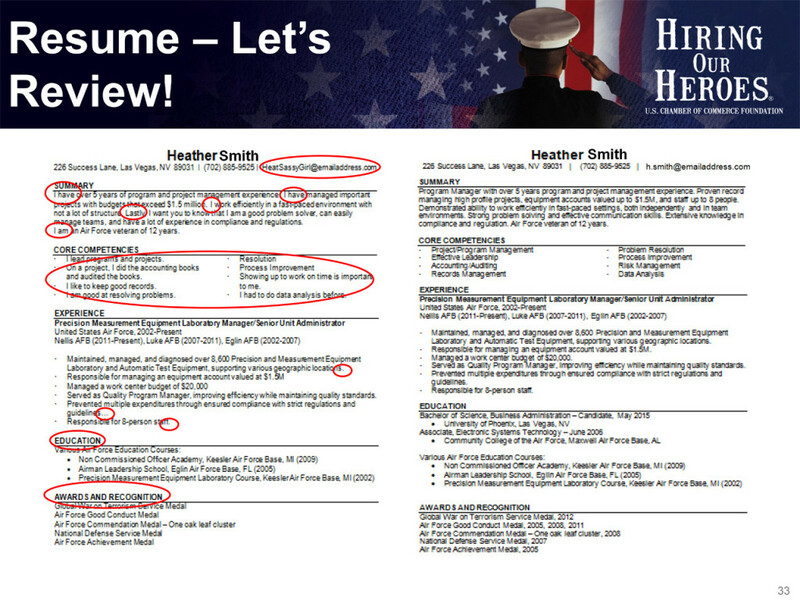 In an interview, Kim Morton, communications manager for Hiring Our Heroes, said that the University of Phoenix had paid the chamber’s foundation to be the sole educational institution present at the job fairs but added that she was “not able to disclose” the amount of money involved. Despite that promise, Reveal found that the University of Phoenix uses its exclusive access at Hiring Our Heroes events to market its services to current and former members of the military. In October, Iraq War veteran Ryan Holleran agreed to take a hidden camera inside a Hiring Our Heroes job fair at the Navy Operational Support Center outside Fort Worth, Texas. 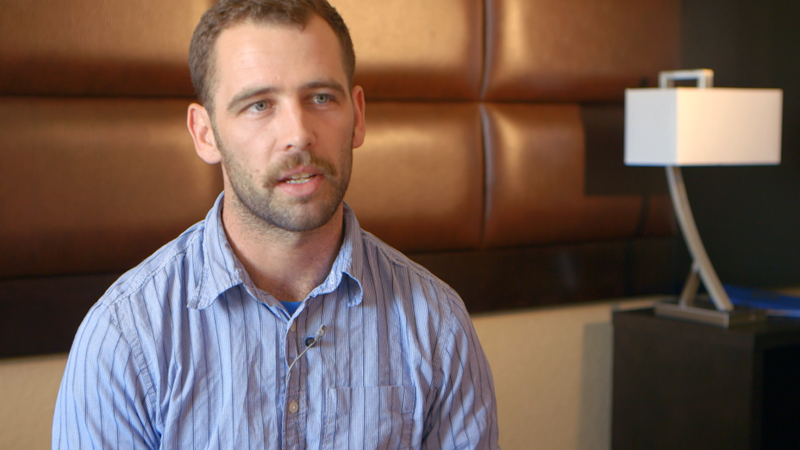 Like many veterans, Holleran, 29, has had a tough time finding a career path since leaving the military. False starts happened at two different community colleges – he dropped out after having panic attacks sparked by post-traumatic stress disorder. Last year, Holleran went online to USAjobs.gov, a federal website that helps veterans find public sector work. When he indicated he had no degree and had served in the infantry, the only job that appeared in his search was gravedigger at a local veterans cemetery. He was hopeful that the employment workshop would help him find other opportunities. Instead, he found something else. In the employment workshop, captured on hidden camera, the trainer repeatedly encouraged approximately 50 sailors and veterans to visit the for-profit college’s website. “The thing the University of Phoenix does is it links you to specific degree programs at their school,” the trainer said as she gave a PowerPoint presentation that prominently featured the company’s logo. The workshop featured examples of do’s and don’ts for résumés. The sample résumé characterized as likely to lead to a job included enrollment in a bachelor’s degree program at the University of Phoenix. The résumé that consigned the veteran to failure did not. The two women allege they were fired last year for failing to recruit enough service members. In an email, the Apollo Education Group’s Mark Brenner referred to an article related to the lawsuit, in which he said the University of Phoenix would “vigorously defend itself against the fictitious allegations” of its former employees. Internal University of Phoenix documents show that the for-profit college meticulously tracks its success with recruitment at the military events it sponsors. Federal law forbids a previously widespread practice, in which for-profit colleges paid bonuses to recruiters “based directly or indirectly” on how many students they enroll. Documents show that the University of Phoenix still records the number of so-called leads each of its national defense liaisons generates, along with the percentage of those leads who eventually enroll. At the Pentagon, Bilodeau said that tracking and compensation measures based on student recruitment are “not in compliance” with government rules and that the Defense Department “would take appropriate action” if it uncovered such tactics. The internal company documents detail the extent to which the University of Phoenix has placed its recruiters in leadership positions at a host of veterans groups, including local chapters of AMVETS, the Navy League of the United States and the Association of the United States Army. The college has worked especially hard to cultivate the American Legion, the nation’s largest veterans organization. In July 2013, the legion backed a congressional effort to forbid for-profit colleges from spending taxpayer money on marketing and recruitment. That measure failed. But that hard line against for-profit colleges began to weaken after the University of Phoenix began wooing the group. In October 2013, Apollo Education Group CEO Greg Cappelli invited the American Legion’s assistant director for education, Steve Gonzalez, to a Chicago Bears game in the University of Phoenix’s corporate suite at Soldier Field. A few months later, Gonzalez traveled to Phoenix to get a tour of company headquarters. When Super Bowl XLIX was held at University of Phoenix Stadium in Glendale, Arizona, in February (the school paid $155 million for the naming rights), the company hosted an American Legion event at its Apollo House in downtown Phoenix. In an interview, Gonzalez said he is “in daily discussion” with two University of Phoenix executives who are retired Army officers: Maj. Gen. James “Spider” Marks, dean of the college’s criminal justice program, and Col. Garland Williams, vice president for military affairs. “We are collaborating with them on multiple fronts on higher education to better their programs to make sure they are providing quality education,” Gonzalez said. The legion has reversed course and now opposes most congressional efforts to regulate or restrict the flow of GI Bill money to for-profit schools, including legislation that would prevent such colleges from being nearly completely dependent on government support for their survival. Gonzalez downplayed the influence of the University of Phoenix’s largesse, saying the change in the legion’s stance reflected improvements by the University of Phoenix, which had “cleaned house and gotten rid of a lot of the bad actors over the past few years.” He declined to say who had been jettisoned. He also noted that other corporations, such as Verizon Communications Inc. and UPS Inc., have hosted him at sporting events. In its effort to position itself as part of military culture, the University of Phoenix produced a custom-engraved coin, which recruiters for the for-profit institution hand out on military bases. For decades, these “challenge coins” have held a special place in military culture, often awarded with a firm handshake by commanders to subordinate service members after a major accomplishment, like completing a specialized mission or returning home from a deployment. Sources told Reveal that University of Phoenix recruiters saved their coins for special occasions, giving them to influential military commanders and other officials to thank them for allowing extensive base access or the teaching of a University of Phoenix class on military grounds. Reached by phone, Pamela Raymer, director of the Army Continuing Education System, would not say whether she had received a challenge coin from a University of Phoenix recruiter. The University of Phoenix’s coin is made of gleaming brass and is about the size of a silver dollar. The official seals of the Department of Defense and every branch of the military are on one side of the coin. The University of Phoenix’s logo is on the other. “I would call that affinity marketing,” said Robert Muth, a former Marine Corps officer who runs a legal clinic at the University of San Diego that helps veterans who say they were harmed by for-profit schools. Because military logos imply an official endorsement, any use of a military seal must be approved by one of the Pentagon’s trademark offices. Reveal checked with the trademark office of every branch of the military – the Air Force, Army, Coast Guard, Navy and Marine Corps – and all said they had provided no license or permission to the University of Phoenix. “Department of Defense and Marine Corps policy and regulations prohibit use of official Marine Corps markings and symbols in ways that imply endorsement of a commercial entity or activity,” Jessica O’Haver, director of the Marine Corps Trademark Licensing Office, wrote in an email. At the Pentagon, Bilodeau said she had never seen the coin before. She said it surprised her, since regulations governing commercial use of military seals are very strict. Pentagon spokesman Lt. Cmdr. Nathan Christensen took a picture of it with his phone and pledged to investigate. “We take this very seriously,” he said.